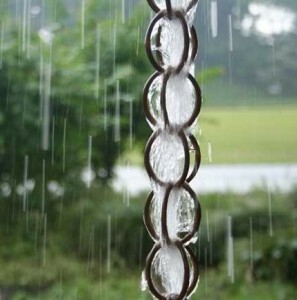 Simply stated, rain chains are alternatives to downspouts in draining water from the Miami roofing to the ground. A more elaborate definition is that rain chains are decorative, more beautiful and equally-functional alternatives to downspouts in transporting water to the ground or container. Rain chains are not a new invention of modern times. They originated and are still widely used in Japan. Japanese have been using rain chains to collect water from the roof, transport it through the decorative rain chains, and eventually collect the water on the ground through large barrels for household use. Most Japanese temples incorporate large rain chains as part of their design. What makes rain chains attractive to a lot of people is their aesthetic appeal in bringing water down from the gutter through the use of differently-designed chains and cups that serve the same purpose as the relatively-plain and common downspouts. Rain chains transform the otherwise-mundane draining of water into an art, from the relaxing and soft tinkling of water droplets through the chains to the calming sound of water rushing through the individual cups tied in a chain. The typical rain chains are either simple chain links that span vertically or made from a series of metal cups with holes on the bottom and are chained together vertically. Rainwater drops down from the gutter through the connected series of rain chains. Present-day manufacturers of rain chains incorporate different materials and designs in their production. Most rain chains today are made of copper; however, other materials are also available including aluminum and brass. The traditional cups and chains are still used although hybrid designs can be found. With a wide range of styles and prices on the market, consumers can choose which particular rain chain type suits their taste and home architectural design. If you are a traditionalist then the link chains are for you because they conform most to the traditional style of rain chains. However, they create more water splashes than cups so you have to keep this in mind when considering to install rain chains on areas that are near walkways, windows and doors. Cup rain chains offer better performance to link chains because their open bottoms act as funnels through which water flows down from one cup to the next below it. Water splashes are greatly reduced even during heavy rainfall, which make them ideal to be placed on just about any area of the house including those near openings like doors and windows. Should You Go For Concrete Tiles in Miami Roofing?